Tivic Health Systems’ ClearUP Sinus Pain Relief uses low current electrical waves to stimulate nerves beneath the skin. 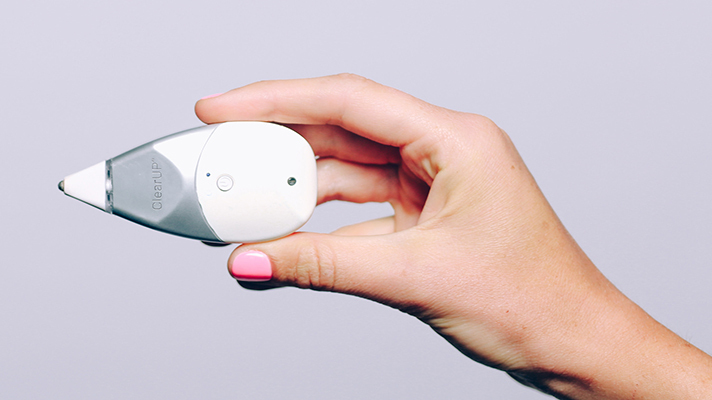 The FDA has granted 510(k) clearance to an over-the-counter handheld electronic device for treating hay fever sinus pains, according to an announcement from its manufacturer. Tivic Health Systems’ ClearUP Sinus Pain Relief device is non-invasive and does not rely on a pharmacological component. Instead, the single-button device is run along the skin of the user's cheek, nose and brow, where it delivers a low electrical current to stimulate nerves below the skin. Tivic Health’s regulatory submission was supported by a double-blind, randomized control trial that enrolled 71 adult sinus pain patients. According to the company, a single treatment with the device reduced sinus pain among 74 percent of the participants, and 82 percent said they preferred it over their current treatment. Tivic Health plans to have ClearUP commercially available later this year. Hay fever, or allergic rhinitis, affects millions in the US, and is primarily treated using antihistamines. ClearUP would provide these patients with another over-the-counter option that is rechargeable for continued use, and does not include the side effects of antihistamines. By and large, digital health has generally focused on tools that help those affected avoid conditions in which their allergies may be aggravated, such those included in the One Medical app or in Propeller Health’s respiratory health forecasting services. Other approaches have included telemedicine consultations with allergy specialists through direct-to-consumer services like PlushCare.